a global warning on global warming! Do you know that clicking the image makes it magically appear larger? that's AWESOME did you carve the shoes? Wow - this page is SOCOOL! 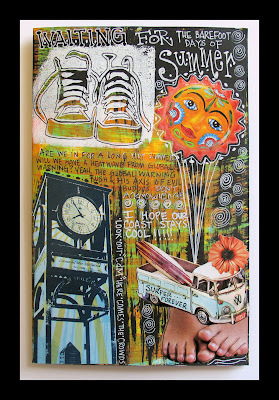 You might just inspire me to do more of my own visual journaling. And I like the "freudian" slip of global warning - perfect - as that is what is going one. Only it seems no one is listening to that warning! Tammy, when I saw my 'mistake' in my wording I decided to keep it that way...I thought it still made some sense...LOL! Thanks for the compliment on the page.